This week, my brother Jeff and his wife, Marsha, celebrated their 30th anniversary. 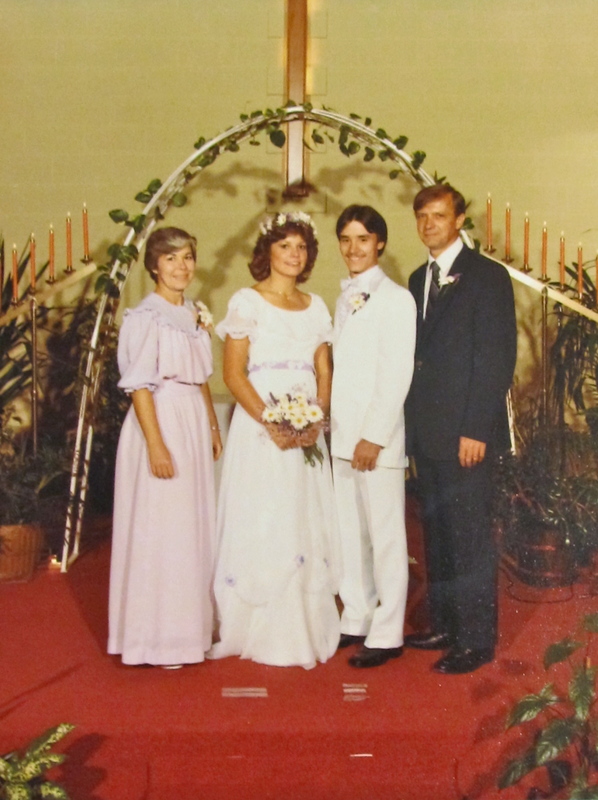 Today’s flashback celebrates their marriage and the beautiful family and life they’ve created together in those thirty years! Congratulations, guys! January 1, 2011, New Year’s Day. Perkins, Mason City, Iowa. December 30, 2011. The Blue Strawberry, Cedar Rapids, Iowa. Please take note of the dates listed in the photo captions, above. These photos capture the fact that 2011 was the year I developed a love for photography. On New Year’s Day, Mike and I met in Mason City (roughly halfway between our two cities of Minneapolis and Cedar Rapids). 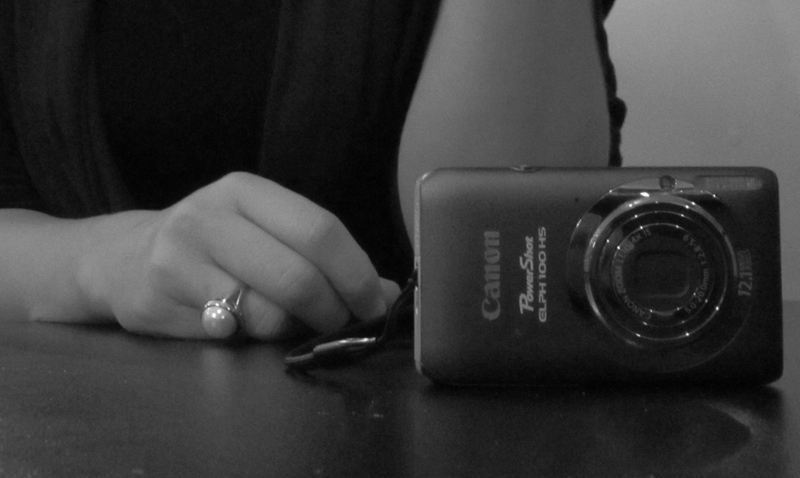 We met to exchange belated Christmas greetings and gifts, and to purchase my first “real” camera. We spent the morning comparison shopping between Best Buy, Target and WalMart. Mike knows cameras – he owns seven (at last count). 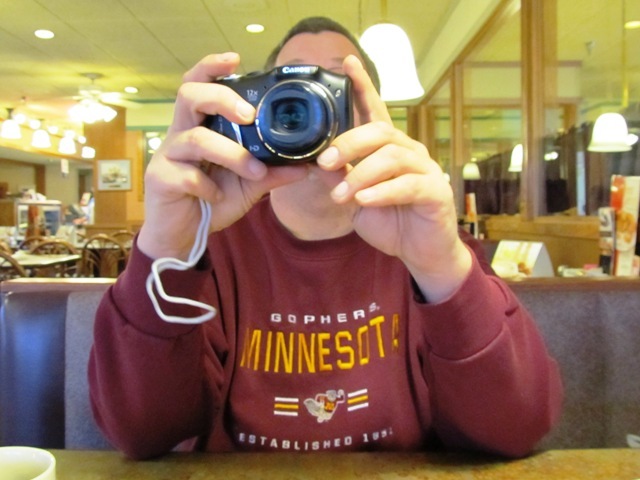 He helped me narrow down the options and select a camera that really works for me: the Canon Powershot SX130 IS. Mike liked the camera I selected so well that he bought one too! In the photo, above, we were opening our cameras and playing with them for the first time. It was -35 degrees and icy that day, so we went to one of the few warm places we knew would be open – Perkins! The second photo is a shot of my friend, Emily. While I have a number of friends who inspire me when it comes to photography, Emily and Mike are the only people I’ve had “photo dates” with. Almost exactly a year after purchasing my camera, Emily and I met on a bleak winter’s day to shoot street shots downtown. I love a number of the photos I shot that day – playing with the black and white function on my Canon – but this shot is so descriptive of Emily. If you knew her, you’d recognize her from this picture! So here’s to photography, photo dates, and incredible people who share your passions in life! For me, two weeks of every August, since 1996, have been spent in Resident Assistant (RA) Training. The 2012-13 RA staff moves in and begins training on Sunday. As usual, I am not really ready for this marathon of teaching and togetherness. However, also as usual, I know that I will end the training period grateful for the opportunity to be part of the lives of such amazing young people. 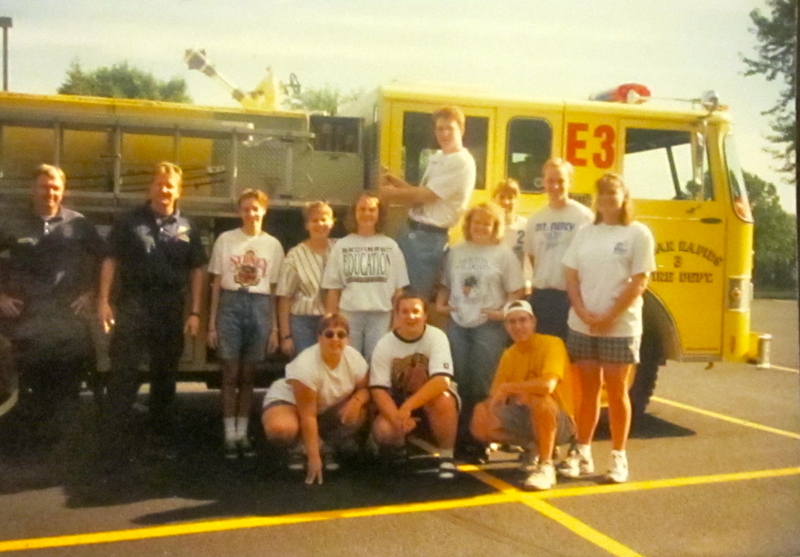 The photo above is of my very first RA staff in 1996, snapped just after their mandatory fire extinguisher training, with members of the CRFD. I remember each of these students – their trials and tribulations, the late night rounds we stumbled through, the laughter we shared. Just remembering humbles me with the awareness of how privileged I have been. 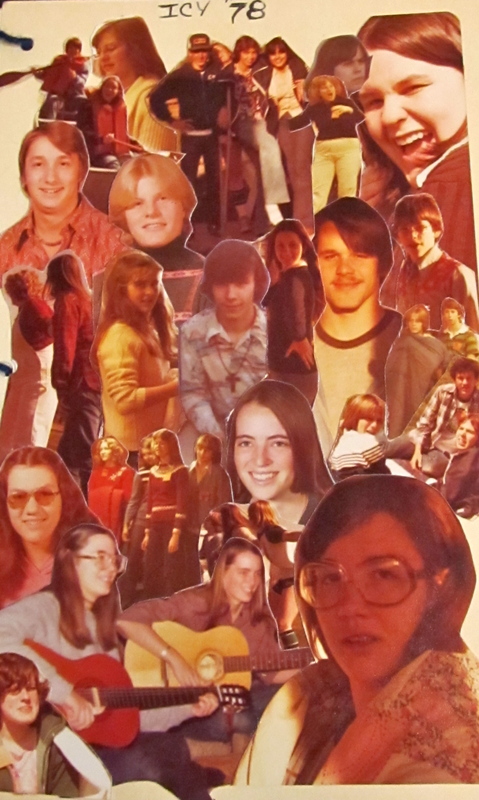 This image is a collage of photographs created for the front of a handmade card friends sent to my brother and I after we moved from Loveland, Ohio to Dubuque, Iowa. I was a senior in high school (my brother Jeff, a junior) and we had a wonderful group of friends cultivated through an ecumenical youth group called Inter-Church Youth – or I.C.Y. I came across this card while searching through boxes of “important” documents looking for a needle in a haystack. This made me smile, and allowed the task to feel more like a treasure hunt than coal mining. In the Hanson household, we were born to protest. In this shot, my sister Chris and I stage a sit-in at Jeff’s Coffee Shop. 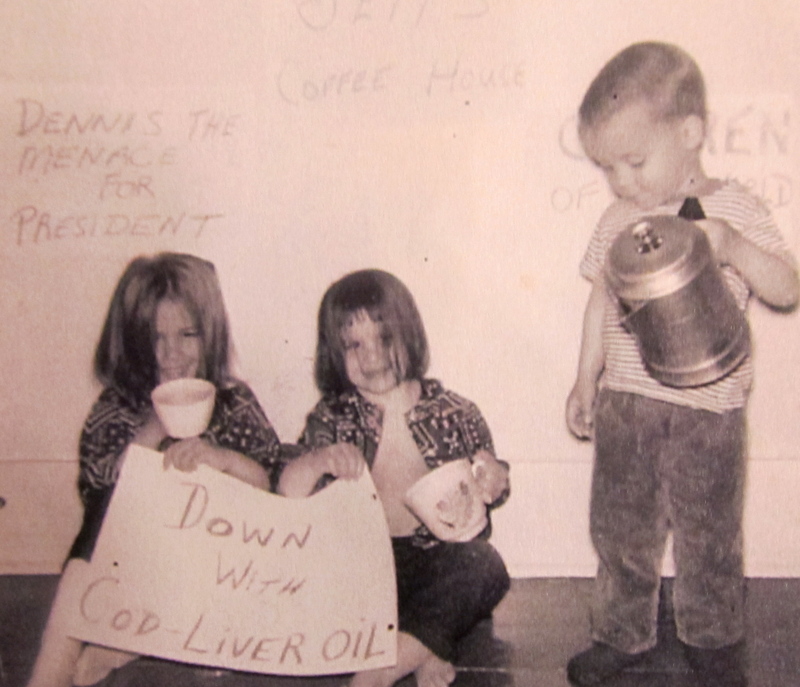 We are protesting cod liver oil. The stuff tasted horrible! I don’t think anyone makes children take this crap anymore – and I like to think Chris and I played some small part in its demise! Flashback Friday – Party Time! Today we have the much-criticized “hipster” culture. Back then, preceding the “hippie” culture, were the Beatniks. 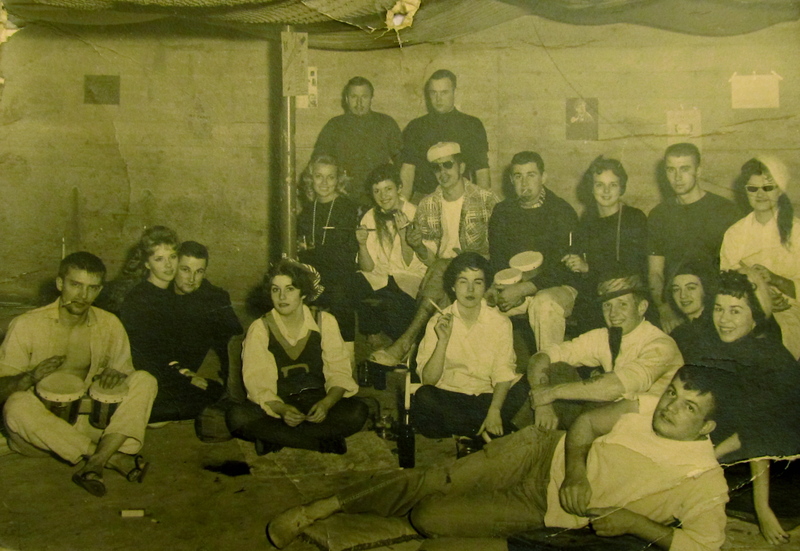 February 1961 my parents and their friends decided to mock Beatnik culture – a creative way to have fun in Iowa in the middle of the most depressing month! My dad is at the left, with the bongos. My mother is looking cool center stage in black beret with cigarette. Flashback Friday – Nice Ride, Brother! It was 1970-something. Back row: Dave, Debbie Ross, Stephanie Beller, Marla St. Clair; Front Row: Jeff Hanson, Susannah Ross, me. 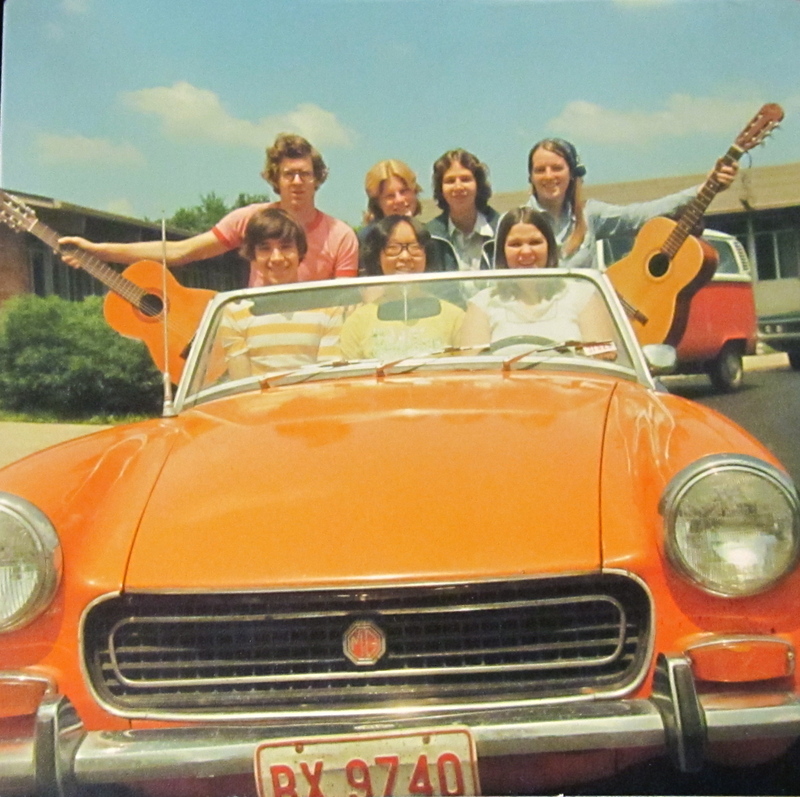 The car belonged to my friend and youth-group leader, Dave Finnegan. From the first night we met, at a Tuesday night Inter-Church Youth (ICY) meeting, I thought he was awesome. Gentle of spirit, kind, and incredibly smart. Not a bad volleyball player. Or too shabby with that guitar. In the ensuing 35 or so years since we met, Dave has been an important influence on my life AND a member of my family – he and my sister Chris were married a couple of years after this photo. They raised two amazing sons, my nephews Ben and Tim, together. 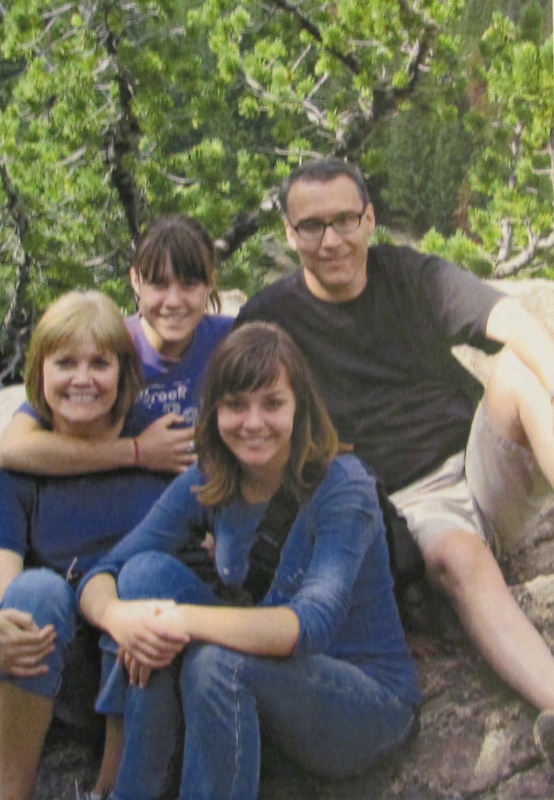 And they have weathered more than their share of serious illness – Dave faced several bouts of cancer, culminating in a Stage IV diagnosis and a grueling experimental treatment program at M.D. Anderson in Houston (he has been cancer free since then, approximately twenty years). My sister, Chris, will have surgery on Tuesday for her second round with breast cancer. What I want to say about Dave in this Flashback is that I couldn’t have chosen anyone better for my sister’s life companion. You know how it is with in-laws: they marry into a family like ours (big, loud, opinionated) and can spend years figuring out how not to be chewed up and spit out. Dave maintains his calm, faithful and principled presence – occasionally making us groan at his terrible puns. In the coming weeks, he will be the gentle rock upon which my sister will lean – and by virtue of his presence where we can’t be, we will all lean on him to an extent (poor guy). After more than three decades, I can say with complete trust that he’s up to the task. I thank God, and my brother Dave, for that!